ABCB6 antibody LS-C19004 is an unconjugated rabbit polyclonal antibody to ABCB6 from human, rat and dog. Validated for ELISA and WB. Cited in 1 publication. ABCB6 antibody was raised against synthetic peptide from human ABCB6. Amino acids 440-455 of human ABCB6 protein. This affinity-purified antibody has been tested for use in ELISA and western blot. Specific conditions for reactivity should be optimized by the end user. Expect a band approximately 94 kD in size corresponding to ABCB6 protein by western blotting in the appropriate cell lysate or extract. 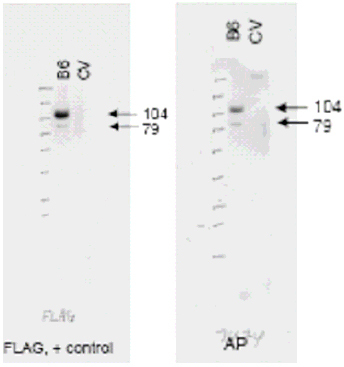 Western blot of anti-ABCB6 antibody (right panel, lane B6) shows detection of Flag-tagged human ABCB6 protein at 104 kD and a truncated form of the protein at 79 kD (arrowheads). The antibody successfully detected ABCB6 in KB cells transfected with the ABCB6 protein. A Lysate prepared from KB cells without a vector insert (CV lane) should no reactivity with the antibody. 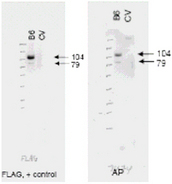 The left panel shows a similar staining pattern using an anti-Flag antibody as a positive control. The membrane was probe.